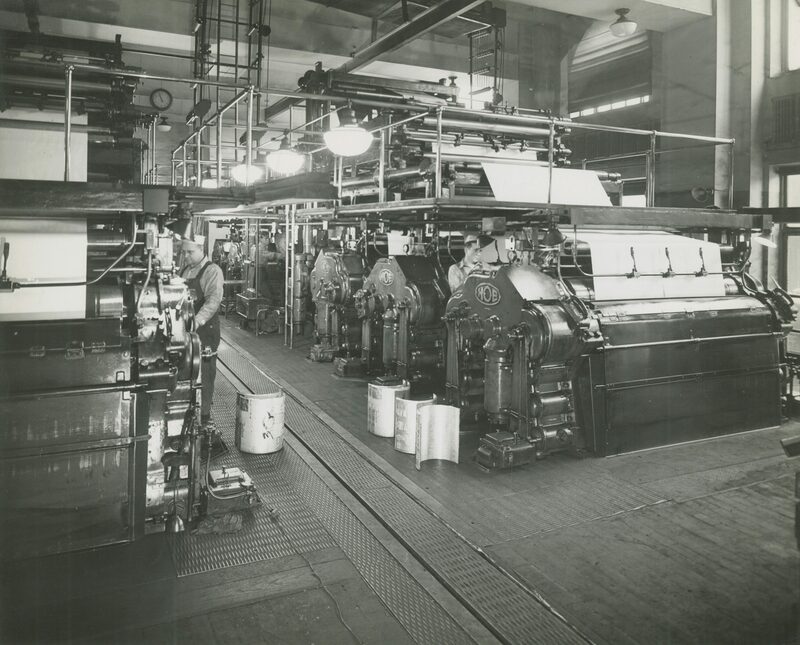 Tied largely to newspaper and magazine publishing, Milwaukee’s printing industry formed in the decade prior to the city’s charter and matured into one of the city’s largest industries, becoming a national industry center through the nineteenth and twentieth centuries. In 1836, Daniel Richards established Milwaukee’s first printing operation near the current corner of Old World Third and State Streets, where he published the pioneer Milwaukee Advertiser newspaper and Increase Lapham’s scientific pamphlets. The emergence of numerous newspapers in the burgeoning frontier community comprised most of the industry’s early development in Milwaukee. Much like Richards’ Advertiser, many of these newspaper operations also printed books, pamphlets, broadsides, and other commercial products. While newspapers like the Weekly Wisconsin developed separate commercial printing divisions, several independent commercial printing shops also emerged in the 1850s through 1870s. These printers often employed only a small number of workers, and produced a variety of items, including stationary, cards, books, and advertisements for local businesses, railroads, and individual clients. The emergence of book publishing houses further contributed to the industry’s growth in the mid-to-late nineteenth century. For instance, one of the city’s most prominent publishers, George Brumder, operated a print shop that also performed commercial jobs. By 1880, printing joined the city’s largest industries, with 24 firms employing around 610 people—predominantly men, but also some women and children. Aside from a brief dip in the wake of the First World War, these numbers continued to grow through the early-twentieth century. In 1907, there were 88 firms employing over 1,800 workers. This increased to 112 firms employing around 1,500 workers by 1917 and 164 firms employing around 2,500 workers in 1928. Several factors contributed to the growth of Milwaukee’s printing industry. First, the development of the paper industry in the nearby Fox River Valley offered easy and affordable access to paper stock. Second, Milwaukee’s burgeoning industrial economy and ethnic communities provided a growing market for advertisements, newspapers, and other printed materials. Third, cheaper shipping and production costs drew in a number of national clients. 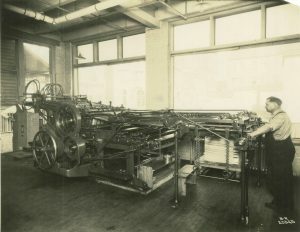 By 1940, Milwaukee had become the eighth largest printing center in the United States, and printing was the city’s fourth largest industry. Through the mid-to-late twentieth century, several printing firms moved to larger facilities in suburban sites across the Milwaukee metropolitan area. Founded in 1934, the W.A. Krueger Company, for instance, relocated as it grew from its original downtown site to a larger facility on 38th Street and Wisconsin Avenue in 1943, and again to new plants in Brookfield and New Berlin in the 1960s. Founded in Pewaukee in 1971, Quad/Graphics developed into an industry giant, printing major national magazines, catalogues, and advertisements in its Pewaukee, Sussex, New Berlin, West Allis, Hartford, and Lomira plants, as well as at other facilities throughout the United States and the world. Quad/Graphics remains the area’s largest printing firm. However, several large commercial printers, as well as numerous small printing, copying, and screen-printing job shops, continue to operate in the Milwaukee metropolitan area to this day. ^ Douglas C. McMurtrie, Early Printing in Milwaukee (Milwaukee: Wisconsin Cuneo Press, 1930), 14, 39-41; History of Milwaukee, Wisconsin: From Pre-Historic Times to the Present Date, Embracing a Summary Sketch of the Native Tribes, and an Exhaustive Record of Men and Events for the Past Century; Describing, the City, Its Commercial, Religious, Educational and Benevolent Institutions, Its Government, Courts, Press, and Public Affairs; and Including Nearly Four Thousand Biographical Sketches of Pioneers and Citizens (Chicago: Western Historical Company, 1881), 612-613; Kirk Bates, “A Century of Printing in Milwaukee,” Milwaukee Journal, May 11, 1940, 4. ^ McMurtrie, Early Printing in Milwaukee, 39-54. ^ McMurtrie, Early Printing in Milwaukee,, 48-54; A.J. Aikins, “Milwaukee’s Printing Facilities,” in Milwaukee’s Great Industries: A Compilation of Facts Concerning Milwaukee’s Commercial and Manufacturing Enterprises, Its Trade and Commerce, and the Advantages It Offers to Manufacturers Seeking Desirable Locations for New or Established Industries, ed. William John Anderson and Julius Bleyer (Milwaukee: Association for the Advancement of Milwaukee, 1892), 67. ^ Industrial History of Milwaukee, the Commercial, Manufacturing, and Railway Metropolis of the Northwest (Milwaukee: E. E. Barton, 1886), 189. ^ Commercial Industries of the City of Milwaukee, Wisconsin (Milwaukee: Riverside Printing Company, 1882), 18-19; Industrial History of Milwaukee, 65. ^ Milwaukee Chamber of Commerce, Forty-Ninth Annual Report of the Trade and Commerce of Milwaukee (Milwaukee: Radtke Bros. & Kortsch, 1907), 48. ^ Milwaukee Chamber of Commerce, Fifty-Ninth Annual Report of the Chamber of Commerce of the City of Milwaukee (Milwaukee: Radtke Bros. & Kortsch, 1917), 76; “The Influence of the Printing Industry Is Far Reaching,” Milwaukee Journal, January 29, 1928, sec. 1, 10. ^ Bates, “A Century of Printing in Milwaukee.”. ^ John Fennell, Ready, Fire, Aim: With a Belief That Ordinary People Can Accomplish Extraordinary Things, Harry V. Quadracci Built a Legendary Printing Company and Changed an Industry ([Wisconsin]: Quad/Graphics, 2006), 27, 36, 40-41; “Firm Moved from City Is Water Poor,” Milwaukee Sentinel, February 14, 1968, sec. 1, 5. ^ Fennell, Ready, Fire, Aim, 46-59, 81-91, 110-111, 132-141, 172, 208-21, 265-275; Quad/Graphics, “The Quad/Graphics Years, 1971-2006: An Evolving Legacy of Innovative People Driving Print,” in Fennell, Ready, Fire, Aim. 8-15; Paul Bodine, “Quad/Graphics, Inc.,” in Make It New: Essays in the History of American Business (Lincoln, NE: iUniverse, 2004), 199-206. ^ Barbara Zaferos, “Top of the List—Commercial Printing Companies,” Milwaukee Business Journal, December 23, 2011, last accessed August 17, 2017; Barbara Zaferos, “Largest Milwaukee-Area Commercial Printing Companies,” Milwaukee Business Journal, January 9, 2015, last accessed August 17, 2017.